*The Charleston Oceanfront Villas: Recently renovated, this 3 bedroom, 3 bathroom beachfront condo is located on Folly Beach, a charming island town only 15 minutes from Historic Downtown Charleston. Dining, shopping, and South Carolina's longest fishing pier are all located within walking distance. *Modern and spacious, this first-floor (but still 20 feet above ground-level) villa includes a King bed, a Queen bed, two Twin beds, and two large sofas that can be utilized as two additional Twin beds for younger kids. Access to a large balcony is through the living room or master bedroom, where you can see and hear the waves roll in off the Atlantic. *The property is fenced & gated and has monitored security cameras. This ensures that safe, ample parking is always available, and that the 2 expanded/upgraded swimming pools are never too crowded. *Folly Beach is less than a 10-mile drive to Downtown Charleston where you can find world-class dining, shopping, and historic sightseeing. Other popular activities include a visit to the South Carolina Aquarium, a tour of the aircraft carrier USS Yorktown, or an excursion to Fort Sumter. The Charleston Oceanfront Villas is the perfect year-round vacation destination! This Villa recently underwent a 100% renovation - Complete HVAC replacement that includes a 'De-Humidify' feature that ensures amazing comfort even during those High Humidity days of July & August. New 18-inch, diagonal-laid, Porcelain Tile throughout, new Paint, new Kitchen Cabinets & Bathroom Vanities(both with high-end granite counter tops), new Light Fixtures, new Draperies, Smooth Ceiling(no more popcorn ceilings!!! ), Beadboard Paneling throughout, new T.V. in Living Room, and some new Furniture. People say that this villa is the nicest rental unit in the entire Charleston Oceanfront Villas Complex!!! Plus, the entire complex recently underwent a $4 Million face-lift, which included replacing the smaller pool with a new full-sized lap pool. The larger pool was renovated as well! HVAC System recently replaced - now with De-Humidify Feature for amazing comfort, even in Summer Months!!! We were more than happy when we arrived at Folly Beach. As we had stayed in the COV complex before we knew what to expect in a 3 bedroom condo. This unit was very clean, tastefully decorated, and made access to the pool and beach very convenient. It's so nice to be able to walk our your condo door and be at the beach, pool, or a nice dinner in a matter of minutes. Sonny was very easy to work with, and took the time time to ensure everything was perfect for our trip. I hope to visit again next season! Our family vacations in Folly every chance we get. This was the nicest, most convenient place we have rented. The condo is very clean and the views are great! We were able to walk to dinner and to Bert's which is something we value. I would give six stars if I could. Wonderful upgraded condo with a beautiful view! We arrived in Folly Beach the last week in April. Coming from upstate New York we found the 80-degree weather and ocean breezes a welcome respite. We found the check in to be convenient, easy and fast. Moving into the condo was easy with shopping carts to assist, an elevator and the condo near the stairwell. The Condo was located on the 1st floor overlooking the pool and with great views of the ocean and Folly Beach Pier. All the rooms were clean and tastefully decorated. The kitchen was fully equipped and made making meals a breeze. 3 bedrooms with 4 beds and 3 baths would make if a perfect spot for up to 6 adults. While the condo was everything we were looking for we truthfully did not spend much time inside because there is so much to do and the weather was beautiful the whole week. 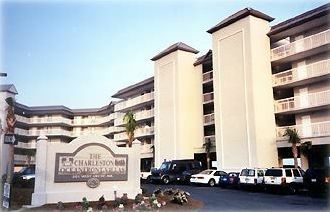 We enjoyed the convenience of the pool and the location to all the stores, restaurants and bars in Folly Beach. Our morning walks to watch the sunrise and then a stop a Bert’s Market for a free cup of coffee was the daily routine. The Island was very friendly to pedestrians and also bicyclists. My daily bike rides ended with a plunge in the ocean and pool. There was plenty to see and do all within walking distance of our condo. Some of our favorite spots beside the balcony, pool and beach were Loggerhead’s, Rita’s Seaside Grille for Shrimp and Grits, St. James Gate and The Barrel just outside of town for a relaxing craft beer. Fresh seafood from Crosby’s Fish and Shrimp company is a must. The only negative was the trip into or out of Folly Beach depending on the time of day. Traffic can be very heavy, and I am sure it is even worse during the busy time of year. There is no reason to leave historic downtown Charleston it is an easy 10 mile trip depending on the time of day. We took several trips off the island to go into Charleston for a Harbor Tour, Charleston Riverdogs baseball game, another day to visit several breweries and finally a day trip to visit The Angel Oak Tree and Firefly Distillery. Harris Teeter is a fully stocked grocery store and a 3 mile drive if you can’t find what you need at Bert’s Market. Folly Beach is certainly a place my friends and I would hope to hope to come back to in the future and I have told many friends of what a wonderful experience we had. All the people we met were extremely friendly and helpful. There is so much more to see and do in the greater Charleston area and hope to get back soon. This oceanfront villa is wonderful! The decor is exquisite. I loved the artwork. The kitchen is fully equipped and very new appliances make food prep and clean up a breeze. The beds are dreamy comfort. The first floor location is great - no need to wait on the elevator. The view of the pool, ocean and the pier are unforgettable. Our family of five adults and a toddler were very well accommodated and loved our vacation in this villa. Folly is a wonderful old beach town with many fun restaurants and bars. We recommend Rita's, Lost Dog, and Taco Boy. A walk through Bert's Market is a must. Our family attempted to rent this condo for our spring break vacation but for reasons beyond our control we were unable to make it happen. Like many of you we sent numerous inquiries on condos in the area only to get auto responses from corporations and some didn't bother to respond. This owner however was absolutely the most attentive person we have ever worked with in the past 8 years visiting the area. Quick & professional email response followed up with a personal phone call. Sonny did everything possible to accommodate our rental request and went above and beyond any other owner we have ever worked with. If you want an attentive owner to work with who will go out of his way to make sure everything works out for your vacation, don't hesitate to call Sonny. Because of his follow-up and demeanor, we will be renting this unit in the future purely because of Sonny. Thanks again Sonny, we will make this work in the near future!!!! Folly Beach is less than a 10-mile drive to Downtown Charleston where you can find world-class dining, shopping, and historic sightseeing. Other popular activities include a visit to the South Carolina Aquarium, a tour of the aircraft carrier USS Yorktown, or an excursion to Fort Sumter.